HOMENutrition Recipes UncategorizedHealthy taco bowls! Who loves Mexican!?? This girl right here!! Just because many Mexican restaurants do not necessarily have the healthiest dishes, does not mean you have to deprive yourself of the goodness! My husband and I LOVE creating these delicious taco bowls! We made ours with lean ground turkey, but you could make yours with lean ground beef, chicken, ect! These are delicious and so simple to make! Preheat oven to 400 degrees. Find a round bakeware dish that you can fit your wrap into. Spray your wrap with some olive oil to help make it crispy. Put wraps in oven for 8-10 minutes or until desired crisp! While the the wraps are in the oven, ground your meat with above spices ( I don’t measure. I just go for it) once meat is cooked through and wraps are done, fill a bowl with meat and desired toppings! I love shredded lettuce, tomatoes, salsa, and a little bit of cheese! Add some grilled veggies or a side salad and BOOM! Complete meal! 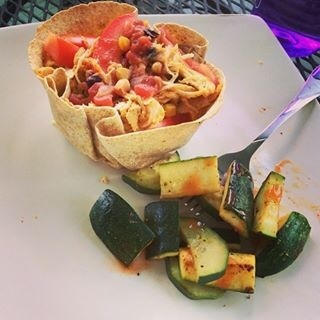 No Comments to "Healthy taco bowls!"